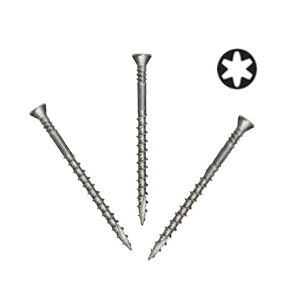 PRODUCT: DISCONTINUED #8 x 2-1/2" Tile Roofing Screws, PAMDrive®, 2/3rd Coarse Thread, Sharp Point, Flat-head, Roofing Tile to Wood. ACQ, CBA-A, CA-B Tolerant. Collated. 1000/Box. Price/Box. For attaching roof tile to wood. Type 17 point improves penetration of tile. Screws hold better. Sharp points pierce glaze. Positive-placement tool design makes work fast and accurate. Reduce broken tiles with PAM's precise control of screw countersinking. Meets Miami-Dade County 12-0322.08, Florida, Protocol PA114-95, Appendix E, Section 2 (ASTM G85). Meets Miami-Dade County, Florida, Protocol PA114-95, Appendix E, Section 2 (ASTM G85).